Though some misinformed Times’ readers might be duped into finding that sentence persuasive, the reality is that Russia has long considered it likely that a Buk or other anti-aircraft missile was involved in downing MH-17. That’s why Russia declassified so many details about its Buk systems for the Dutch investigation – something governments are loath to do – and the Russian manufacturer issued a report on the likely Buk role last June. It should be noted, too, that just because Russia no longer deploys the outmoded Buks doesn’t mean that it might not have some mothballed in warehouses that could be pulled out and distributed in a sub rosa fashion, although both the Ukrainian rebels and Russian officials deny this possibility. According to the Ukrainian government, the rebels were only known to have shoulder-fired “manpads” in July 2014 – and that weapon lacked the range to destroy a civilian airliner flying at 33,000 feet. As described in the Dutch report, this Ukrainian concern was quite real in the days before the MH-17 shoot-down. On July 16 – just one day before the tragedy – a Ukrainian SU-25 jetfighter was shot down by what Ukrainian authorities concluded was an air-to-air missile presumably fired by a Russian warplane patrolling the Russia-Ukraine border. Another theory that I’m told U.S. intelligence analysts examined was the possibility that a rogue Ukrainian element – linked to a fiercely anti-Russian oligarch – may have hoped that President Vladimir Putin’s official plane was in Ukrainian air space en route home from a state visit to South America. 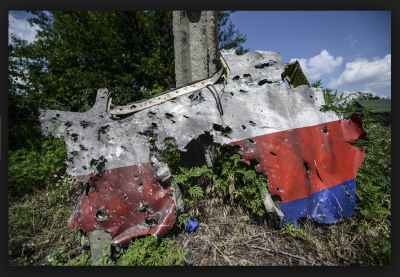 Putin’s jet and MH-17 had very similar markings. But Putin used a different route and had already landed in Moscow. But whatever your preferred scenario – whether you think the Russians or the Ukrainians did it – the solution to the mystery could clearly benefit from President Barack Obama doing what Putin has done: declassify relevant intelligence and defense information.